If various coupons, pop-ups, deals, and other kinds of advertisements are bothering you on such online shopping websites as ebay.com, amazon.com, bestbuy.com, and the like, you should check whether Coupon Lasso is not residing on your system. This software has been published by Smart App and it acts very similarly as Savings Wizard, Bee Coupons, Sharp Savings, and the like. Unfortunately, Coupon Lasso is nothing more than just an advertising-supported application; thus, we do not recommend trusting it blindly. This adware program is just going to generate various advertisements and might even expose you to threats via them. Thus, we believe that there is no point in keeping Coupon Lasso on the system. The only reliable way to get rid of it is to delete it entirely from the system. 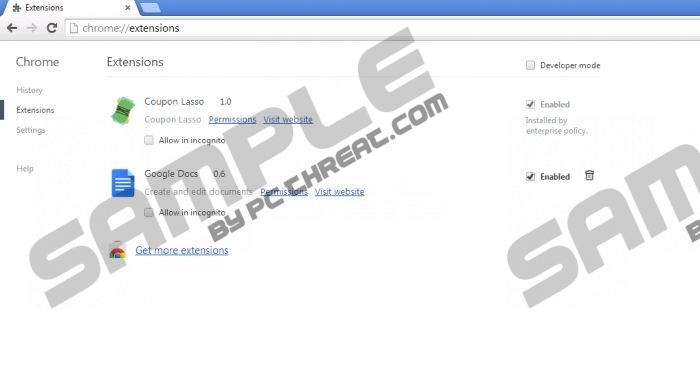 Have you already noticed Coupon Lasso on your system? If so, it is very likely that your system is infected with a potentially unwanted application called BenchUpdater as well. The specialists of pcthreat.com have revealed that this adware comes bundled with the aforementioned application. It acts like adware helper and is capable of changing Windows hosts file. Actually, it is not the only drawback of Coupon Lasso. It has been found out that you might infect your system with various undesirable applications as well because you will never know where you will be taken after clicking on any of those advertisements. On top of that, Coupon Lasso is going to collect the domain and the URL of the websites visited, web log information, and other details associated with your place of residence (e.g. state, city, and country). This information is collected and stored by cookies; however, other data tracking technologies might be used as well. Keep in mind that the only way to stop this activity is to remove the program from the system. Thus, if it seems that this activity is highly suspicious, you should definitely get rid of Coupon Lasso without any considerations. The removal of Coupon Lasso will probably not cause you any problems because this software can be removed easily and quickly via Control Panel. Keep in mind that you can use the instructions provided below the article for this matter; however, if you have any difficulties regarding the manual removal of Coupon Lasso, you can try scanning your system with a licensed tool. It will detect all the threats and you will just have to click one button in order to delete them all. Find Control Panel on the list of applications. Select it. Right-click on Coupon Lasso and then click the Uninstall button to erase it. Find the suspicious application and select it. Locate the program that you wish to remove. Click the Remove button to erase it. Quick & tested solution for Coupon Lasso removal.